At Chet’s Medical Supplies, Mike and Raph stumble on a breaking and entering. Two thugs, Splat (the short-tempered and short-statured one) and Beggar (the dull-witted, gargantuan one), force their way in, unaware of their Turtle pursuers. 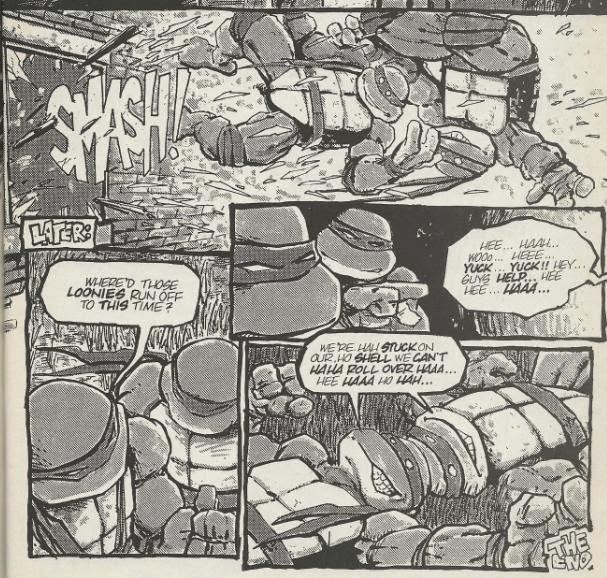 As Raph tackles Beggar, he inadvertently (and unknowingly) busts open a tank of nitrous oxide. As the room fills with the gas, the Turtles go after Splat, next. Meanwhile, outside, a police patrol notices the break-in and calls for back-up. Inside, Raph is getting woozy from the gas, allowing Beggar to deliver a kick to his face. As Mike disables Splat by mummifying him in medical tape, he fails to notice Beggar sneaking up on him until after the thug cracks him over the skull with a crate. The gas is starting to take its toll, as Beggar laughs himself silly at the sight of Splat all wrapped-up. Raph decides to take his foe out with a dramatic battle cry (“Kowa-Banzai!”) and a flying leap, but instead flies between the two. 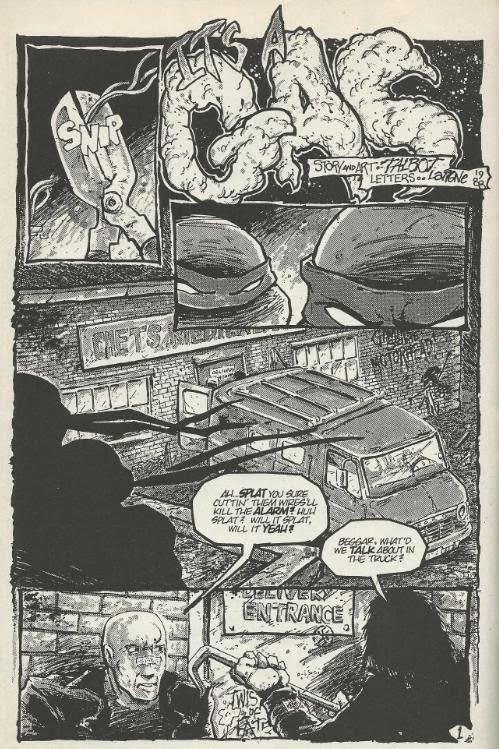 As the police burst in and arrest the thugs, Raph’s flying leap sends him onto a rolling table, crashing into the dizzy Mike and then carries them both straight out the window (all without the police noticing). Leo and Don eventually locate their brothers, laying in a grassy patch completely whacked out of their gourds on nitrous oxide. *This story was reprinted in the “Shell Shock” trade paperback. *CHET ALERT: The store the thugs break into is “Chet’s Medical Supplies”. The name “Chet” was an Easter Egg dropped into numerous Turtle stories by the Mirage staff because… They just liked the name! Here’s another short comedy strip that I probably wouldn’t be very fond of it if weren’t for Talbot’s art. Much like “Not One Word”, it’s a slapstick piece with an only partly-amusing punchline and little of actual substance going on in it. However, also like “Not One Word”, a completely mediocre strip is elevated to a more memorable status thanks to some killer artwork. While I dig Talbot’s style, I wouldn’t say this is one of the best examples of his work; cool-looking though it may be. There are panels littered alllll over the freakin’ page; there’s too much going on at once and the action can be a little tough to follow. The inking and toning only adds to the confusion, as Beggar’s jacket color changes between panels from grey to black (black also being Splat’s jacket color). As such, one panel has Raph throttling Beggar, then what looks like Splat’s arm uppercutting him (thanks to the jacket miscolor) and then Raph flying off of Beggar who is pulling back from the blow he just delivered. 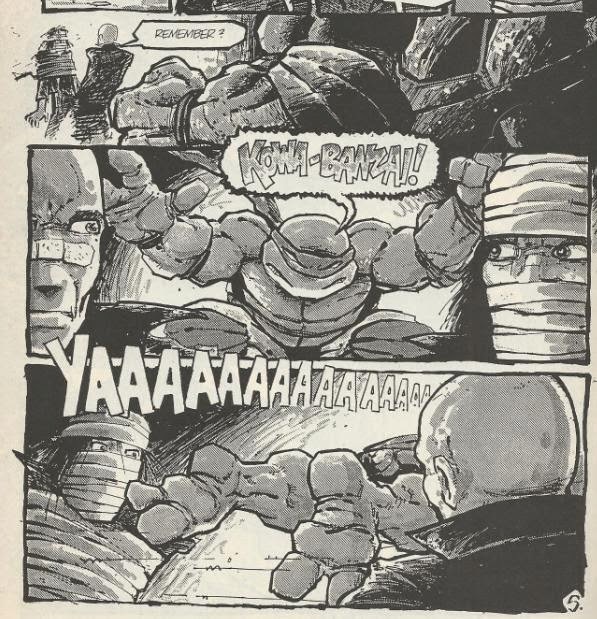 But where the layouts and inking suffer, the joy lies in Talbot’s Turtles, who switch gears from horror movie-menacing to goofy and whimsical in a snap. As I mentioned in my review for “Not One Word”, Talbot’s dark style works well with these comedy pieces, as you’re so caught up in the “serious business” appearance that the gags hit you by surprise (such as Raph dramatically leaping at the thugs and dramatically flying right between them). So while this isn’t the best example of Talbot’s work, it’s hardly a bad piece. A tad bit over-drawn, but I'd sooner have that than under-drawn work (think Lawson’s contemporary style) any day.